The world of 3D printing is moving at an incredible pace and that is truly evident in the medical industry. 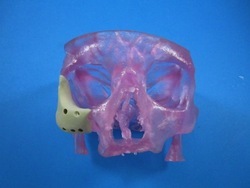 Oxford Performance Materials has not gained FDA approval for their custom 3D printed facial implants. Oxford Performance Materials' OsteoFab Patient-Specific Facial Device is designed to function just like real bone which isn’t all that revolutionary. What is the exciting part is that it can be custom tailed to the anatomy of any patient. This means that when a patient needs facial reconstruction surgery, a new facial structure can be printed instead of custom built by surgeons. These facial implants are created using digital MRI or CT scans from the surgeon. They can be taken in the U.S. and then sent to Oxford Performance Materials where the implants are created and then shipped to the U.S.
Now patients in desperate need of facial reconstruction can find themselves undergoing surgery must faster than before. The surgery is also safer and has a much greater chance that the new face will look just like the old one. Perhaps the best part for patients is that along with all the other benefits, these custom facial implants are cheaper than having surgeons reconstruct the face during surgery. These facial implants have not yet been used in the U.S. but thanks to FDA approval they are now available to all doctors who need them. Oxford Performance Materials also made headlines earlier this year when their cranial implants were able to replace 75% of a patient's skull. It is possible that the combination of facial and cranial implants could be used together to help patients in need of more intensive reconstructive surgery. Fine technology, but one caveat. 'Oxford Performance Materials' is a company based in South Windsor, Connecticut, New England. The company website does not suggest any connection to Oxford University, (Old) England - which also does research in this area.